The baigan roasts best on a flame. But in case you have a cooking range without one, as i do, it roasts just as well. The time taken being a little longer. Also, one can clean up later quite easily. So, roast the brinjal well. When the juice starts coming out of the vegetable, consider it done. Make sure that all sides are uniformly roasted. Let it cool. Now, peel off the charred skin which should come out easily. Mash the deskinned brinjal randomly with a knife. Take a wok and heat the oil. Add chopped green chillies and asafoetida powder, stir for 30 seconds. Add chopped garlic. Fry for a minute. Add chopped onions and fry till it turns pink/brown. Add the chopped tomatoes and fry for another 2-3 minutes. 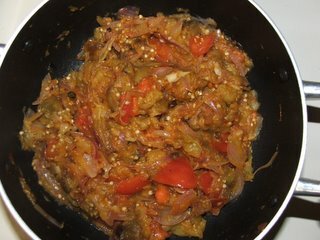 Now add the brinjal and mix well. Add salt and red chilli powder. Mix and you are done. This one really goes well with plain roti and dal.